Transforming Hollie: A GIVEAWAY with a purpose! Several weeks ago, I was sent a sample of Perdue's Short Cuts Roasted Garlic with White Wine for my review on this blog. I tried it, I loved it, and I agreed to do a giveaway. And then I forgot! Thankfully the nice people at Purdue reminded me about it the other day! They have a great incentive to go along with the giveaway. 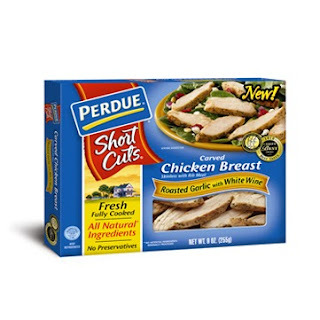 You will receive a package of Perdue's Short Cuts Roasted Garlic with White Wine. 1. Upload your favorite chicken recipe at HERE and dedicate it to anyone touched by breast cancer. For each chicken recipe uploaded from October 1, 2010 through November 30, 2010, Perdue Farms will donate $1.00 to Susan G. Komen for the Cure®, up to a maximum donation of $10,000. 2. Post the name of your recipe in the comments section of this blog post. You have until midnight November 21, 2010 to enter. 3. You can also get an extra entry if you "Like" my SkinnyHollie Facebook page. Just leave another comment on this blog post to let me know. FCC Disclaimer: Purdue sent me free chicken for me to honestly review. I really liked it and wanted to give some away to my blogger friends. Quick question: is this open for international followers as well?? I write a similar blog called The Fatty Chronicles, it's my weight loss adventures, medical treatments I've tried, and recipes for success! Hollie... I just started reading your blog (I went back to the beginning even). Keep trying the only true failure is never trying at all. One suggestion. You might want to try carbonated mineral water as a substitute for cola. La croix makes some that are even flavored (no sugar or artificial sweeteners). On the cheap side you can even get 2 liters of Big K sparkling water and add a bit or lemon, lime, or orange juice yourself. How in the world did I miss this giveaway?!?!?! I am ALL about anything for breast cancer awareness!!! OK recipe posted for BBQ chicken flatout pizza! !